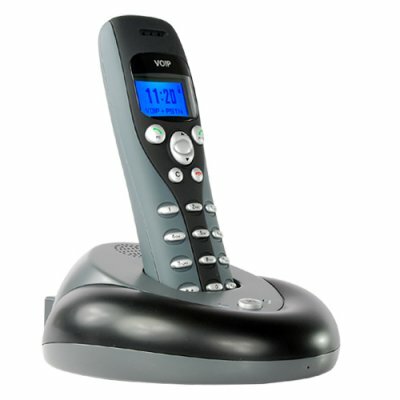 Successfully Added Skype VoIP USB Wireless + Landline Phone (2-in-1) to your Shopping Cart. Skype VoIP USB Wireless + Landline Phone for the versatility to make normal phone calls and free Skype calls anytime. This Skype VoIP USB Wireless + Landline Phone is the perfect partner for your Skype experience allowing you to make and receive free Skype calls. It incorporates seamlessly with your Skype account so your Skype contacts are automatically uploaded to the handset. Light and compact, it can be USB powered to sit next to your PC, making it ideal for small business or home office users as the speakerphone in the base allows you to talk handsfree. But the beauty of this unit over other Skype phones is that you can also use it to make and receive land line also known as "home phone" calls. What's more, switching between the two calls types is done automatically. An Ethernet port at the back of the base accommodates your internet connection while a RJ11 jack connects to your home phone line. Whichever type of call comes in, simply pick up the handset and you're ready for crystal clear conversations with friends. This full-featured unit has a large LCD screen with blue backlight for better visibility, an anti-slip design for a more comfortable grip, and exceptional handset to base range of 50 meters so you don't have to be confined close to the base. Voice technology like noise reduction, digital echo cancellation, and auto-select RF channels ensures that conversations are always crystal clear, and there are 10 different ring tones to choose from. This amazing 2-in-1 phone does it all while being inexpensive enough for resell to your valued customers. Order one or a hundred from the number one direct from China wholesale electronics supplier, Chinavasion. Use it as a standalone cordless phone without a PC computer by powering this unit with AC adapter. Exclusive Skypemate bundled software allows the phone to seamlessly pair with your Skype account, contact, and calling history. How do I switch between Skype and normal landline phone calls? Switching is done automatically. Whichever type of call comes in, simply pick up the handset to listen to the call. I wrote before that the product was acting weird. The problem was I had to restart my PC after installation. Now the phone works without any flaws. Thanks Chinavasion for your support. I will recommend this phone to anyone.